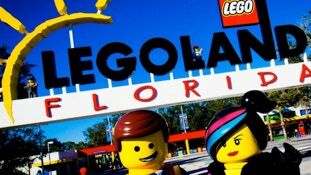 LEGOLAND: Located approximately 40 minutes drive from our vacation homes. A must visit attraction for the young and the young at heart. At 145 acres it is the second largest Legoland in the world. The park has over 50 rides, shows, attractions, restaurants, and shops all designed to look like they were built from Legos. Legoland is on the site of Cypress Gardens and the original botanical gardens have been preserved and restored to be enjoyed by future generations. KENNEDY SPACE CENTER: Located approximately 70 minutes drive from our vacation homes. Experience America’s space program first hand from the actual launch site of many historic missions. Learn about the history of space flight and see actual items used in the space program. The Rocket Garden is an outdoor display of historic rockets that put America into space. 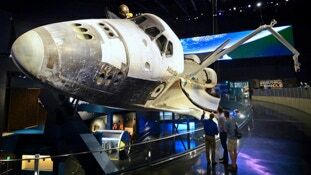 See the Space Shuttle Atlantis in an unforgettable experience and try your hand at the Shuttle Launch Experience. Guided bus tours give visitors an insight into the workings of an actual launch facility. Tour highlights include the massive Vehicle Assembly Building, the actual launch pads, and the old Mission Control Building used for the Moon landing. Also on the tour is the Apollo/Saturn V Center which houses a massive Saturn V rocket. With a respect for the past and an eye on the future the Kennedy Space Center is not to be missed. LAKERIDGE WINERY AND VINEYARD: Located approximately 40 minutes drive from our vacation homes. Perched atop a hillside in nearby Clermont Lakeridge Winery and Vineyards offer winery tours and wine tastings. Lakeridge is the largest winery in Florida. BOK TOWER GARDENS: Located approximately 50 minutes drive from our vacation homes. 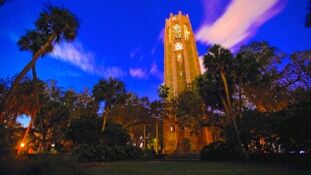 Sitting on the highest peninsular in Florida the beautiful Bok Tower is one of Florida’s most famous landmarks. Built in 1927 from pink and gray Georgia marble and coquina stone from St. Augustine the tower houses more than 57 carillon bells which ring out in daily recitals. The surrounding 157 acres of lush gardens and nature trails feature azaleas, camellias, and magnolias. BUSCH GARDENS: Located approximately 60 minutes drive from our vacation homes. This 335 acre park African themed park is packed with thrill rides, live entertainment, animals in naturalistic looking settings, shops, restaurants, and games. The park is divided into nine themed areas including, Morocco, Egypt, Stanleyville, Congo, Pantopia, Nairobi, Jungala, Edge of Africa, and Sesame Street Safari of Fun. With so many animals wondering throughout the park it is one of the top zoos in the country. ADVENTURE ISLAND: Located approximately 60 minutes drive from our vacation homes. Busch Gardens water park offers an experience flowing with fun. This 30 acre water park has water rides, dining, and other attractions. ATLANTIC COAST BEACHES: Located approximately 60 minutes drive from our vacation homes. The Atlantic Coast beaches offer white sand beaches and a lively ocean. GULF COAST BEACHES: Located approximately 90 minutes drive from our vacation homes. The pure white sandy beaches and picturesque green waters of the Florida Gulf Coast are truly spectacular.